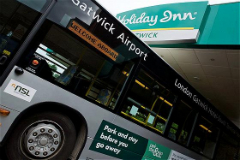 Holiday Inn Gatwick Airport is just five minutes from the Airport. 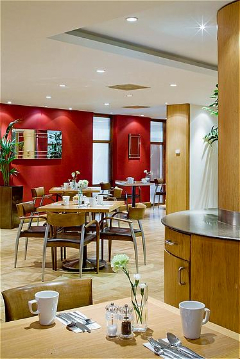 There's an excellent range of facilities and services for business and leisure travellers, inc. Free High Speed Internet Access. 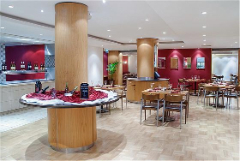 Family rooms have plenty of space and kids under 13 eat for free. Shuttle service runs 24 hours, every 15 mins 5am and midnight, every 30 mins through the night. All rooms have en-suite bathroom, tea and coffee tray, interactive TV, free high speed internet access, radio, trouser press and hair dryer. Day rooms available. 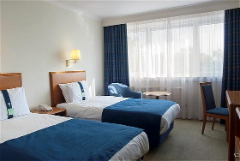 Family rooms for 4 will consist of a double bed and a double sofa bed. There are four suitable rooms in the hotel, available on request. Please advise at the time of booking. Drive to rear of hotel and park in short term parking. If you have booked the standard parking package your car will usually be parked on site in the hotel car park, however at very busy times, at the hotels discretion, your car may be moved off site to Maple Manor Parking. You must leave your keys at reception when checking in. Vehicles are left at owners risk. Transfers are charged at £3.00 per adult and £1.50 per child each way, (under 5's free). Taxis can be arranged for approx £6 each way. Full English breakfast is £15.95 per person, FHR clients can purchase voucher at reception to get special £12 per person rate. Between 6am and 10am. Children sharing a room with adults must be 16yrs or under. **IMPORTANT ** If you are planning to use your inclusive parking before your stay at this hotel, you MUST inform us of the date you will be leaving your car (by phone 08707 456347 or by email to reservations@fhr-net.co.uk). Excellent value. FHR have always delivered exactly as expected if not more. I wouldnât use any other company! All worked perfectly and will use this arrangement in future. Have stayed here before and good standard maintained. 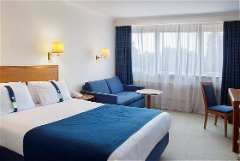 Comfortable accommodation with excellent service for car parking and transport to and from airport. Once again the Holiday Inn matched expectations. 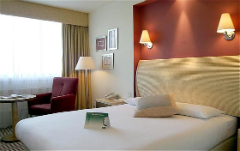 We had booked 1 double, 1 family and 1 twin room and as per our request the rooms were situated together. The staff were very polite and helpful. The food as always was very tasty. Have stayed here before so knew what to expect, usual polite and efficient staff, check in easy, paid for the bus tickets at reception, which you get on outside the main entrance to take you to the airport terminal, pre ordered the breakfast and this was at a discounted rate having booked through FHR, breakfast was great too, with plenty of choice. Hotel clean but in need of refresh. Told upon arrival that we needed to book a table at the restaurant only to find there were hardly any other diners there. Superb in dealing with my car parking when the flight was delayed. Very convenient for airport. Shuttle bus reliable and good price. Hotel very comfortable with good facilities. No problems parking. Overall very good service. 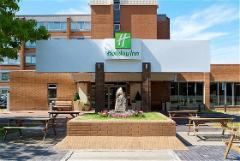 The Holiday Inn hotel was top class parking was very near the exit and easy to find,Room was very nice and overall we were very impressed by the complete package, The shuttle bus service was excellent! Very efficient service. Easy process to drop car off and it was waiting for us on our return. Only possible issue was it was dustier/dirtier than when left. Very convenient for Gatwick flights. Parking is easy and they give good directions to your car when picking up. We bought tickets at reception for the airport bus for both out and back to save time on the bus. The bar food was not all available and the meal not as good as previously when the food had been hotter. All rooms are comfortable. Excellent customer care, clean well presented room and good food. Highly recommended and I will certainly use this hotel when departing Gatwick. Quick efficient check in. No problems parking car and bus to airport collect/drop off outside door of hotel. Very impressed with all aspects of this hotel. Stayed the night before our flight. Very quick to check in very quick to check out and brilliant bus to airport. Also return to the hotel from the airport was quick and car was ready and waiting for our swift departure. Will definitely return to this hotel with parking for our next trip from Gatwick. Hotel room was fine & parking easy. We like the frequency of the shuttle buses too. The food is expensive so walked over to Airport Inn & had 2 courses plus glass wine each for Â£29,99. Welcoming staff when checking in and out at reception. Lovely clean room. I booked a quad room, 2 double beds, on arrival I was told that my booking was for a twin room and they do not offer quad rooms. We ended up in a room with a double bed and sofa bed, this was for four adults. I booked this room as we had travelled from the Isle of Wight and had an early morning flight, I thought this way it would be less stressful and tiring (I was wrong). I will not book through this Company again, the hotel told me to never book through FHR again, I have taken this on board. Approaching from M25 and M23 Motorway,leave M23 at junction 9, towards Gatwick Airport.Continue over the next roundabout, Do Not Enter Gatwick Airport, but follow the signs to Redhill and Crawley A23.Turn right at next roundabout and join A23(Redhill and Crawley)from the slip road.At the next roundabout continue straight across and the Holiday Inn Gatwick is directly on the left hand side after the roundabout. Drive to rear of hotel and park in short term parking. If you have booked the standard parking package your car will usually be parked on site in the hotel car park, however at very busy times, at the hotels discretion, your car may be moved off site to Maple Manor Parking. You must leave your keys at reception when checking in. Vehicles are left at owners' risk. Where applicable, additional days parking are subject to availability and charged by the hotel at £16.00 per day and are paid direct to the hotel's parking facility when you return to collect your car. Important If you are planning to use your inclusive parking before your stay on return at this hotel, you MUST inform us of the date you will be leaving your car (by phone 08707 456347 or by email to reservations@fhr-net.co.uk). On arrival at the hotel you MUST check your car in at reception before leaving for the airport. If you do not follow this procedure you may be charged again for your parking. Airport transfers: The Shuttle Bus runs 24 hours per day every 15 minutes and every half hour from midnight to 5am to both terminals. From 1st August 2008 transfers are charged at £3.00 per adult and £1.50 per child each way, (under 5's free). Taxis can be arranged for approx £6 each way. Full English breakfast is £15.95 per person, FHR clients can purchase voucher at reception to get special £10.95 per person rate. We are looking to book a room prior to our holiday in January 16, 3 of our party have Vegan diet can you accommodate this from your evening menu?We have checked with the hotel and they are able to accomodate this.